The plan: a music-free holiday at Arosa, a busy ski resort as beautiful as its name, 1850 metres high in the Swiss Alps, comfortably uncrowded for alpine walking during the quiet summer months. The event: the irresistible surprise discovery of Arosa's Kultur Sommer in full swing, with rarely staged Haydn and Mozart operas to be enjoyed in an idyllic open air venue, backed by pines and enclosed by a rocky wall which creates a wonderful acoustic. Having reviewed eight of Haydn's operas, championed by Antal Dorati but still infrequently seen, we were intrigued by the German/Czech musical polymath Andreas Kröper's choices for Arosa 2005 (they also staged Bach's Coffee Cantata and Peasant Cantata). Haydn's La Canterina (1766), unknown to us, proved to be a slight but delectable chamber opera, with two rival suitors for the favours of the signora virtuosa, aspiring opera diva Gasparina who, abetted by her mother, tricked both dolts out of their money. There were good arias for everyone, an extremely funny singing lesson trio, and quartet ensembles to end each of the two acts. The singing-acting was fine, with no cast weaknesses. Non-singing parts were capably taken by local members of the technical and support staff, who became contemporary removal men and a policeman, summoned by mobile phone for an eviction scene, to hilariously incongruous effect. The production values of Ope(r)n Air Waldbühne Arosa were impeccable. The presentation was enthralling, even without understanding a word of the Italian. The staging of La Canterina is extremely ingenious, with an opening scene shown in shadowplay, in which the two women prepare themselves to receive Casparina's admirers, before the screen is torn down and they are revealed in sumptuous costume. Eighteenth Century gesture in this production, and especially hand movements, are a particular delight and enliven the recitatives, which are fully communicative even without one understanding the dialogue. The high class period instrument orchestra of a dozen underpins the stage goings on, which spread around the theatre amongst the audience from time to time. He believes in the integration of all elements of opera, and Arosa offers him the unique possibility to satisfy his vision with a sympathetic team; no need to compromise with a director's discordant 'concept' as is the way in the mainstream world of opera. Few opera lovers are likely to catch La Canterina up in Arosa; the whole show cries out to be perpetuated in video/DVD. It has a carefully thought through totality, fully on a par with far more prestigious opera productions in Europe's famous festivals, and would be ideal for home viewing by those many unlikely to travel to see the highest opera in Europe. 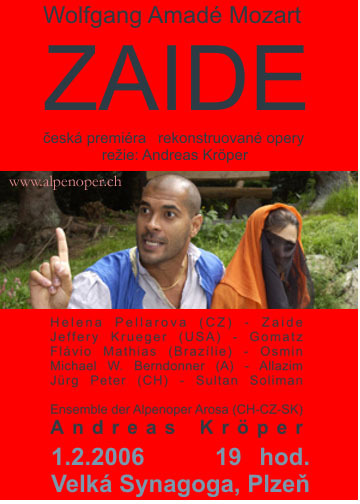 Zaide had to be given in a 'very reduced' version of Andreas Kröper's production**, transferred on a rainy night to the church hall up in the town, so it would be inappropriate to review it in any detail. Suffice to say that the performance was well prepared by a fine team of musicians and young singers, who colonised the whole awkward space to best possible effect. I must mention the Osmin, Flavio Matthias, an impressive lithe, slender bass [pictured here and in advert below] who electrified the second act with Mozart's show-stopping laughing song - as memorable for English listeners of a certain age as Charles Penrose's famous Laughing Policeman, a never-forgotten top favourite 10" shellac disc in my family's record collection! Arosa is fortunate to have an ongoing association with Andreas Kröper, who has a considerable reputation as an early music specialist in European & American festivals. He directed his own reconstruction of the original Zauberflöte in Prague (recorded on DVD) has 25 CDs (classical and jazz!) to his name and plans to tour his completed Zaide in Europe, the United States and Japan next year to mark the 250th anniversary of Mozart's birth. * ° On Andreas Kröper's website you will discover that he is also an adept jazz flautist! ° listen to The Laughing Policeman ! ° P.S. A correspondent tells me that he has attended one "higher" opera festival; " Yes, there is one which is "higher" - Santa Fe in the US, in the middle of a desert at around 8500 ft. up! "